I am building a server for one of my small business clients, it's a Dell PowerEdge 2950 with a Perc 5i RAID controller on board. This is an older server, but it is plenty powerful for what I need out of it. The idea is that this server will be used as an iSCSI target for an ESXi host. I don't know where the server initially came from, but when I got it from the client to build out, it only had 3 hard drives in it of various sizes, nothing big enough to be a storage server. I had a collection of old ST3450856SS hard drives from an old HP MSA2000 storage frame which were SAS drives of 450GB. I got the additional drive cages as required and mounted 6 of these old HP SAS disks into the server. The Perc 5i controller picked up on them no problem, and I was able to create a RAID5 set and off I went...however, I soon discovered some issues. Now Perc 5i created the drive array no problem, it was accessible, but when I tried to run a CrystalDiskMark benchmarking tool on the server, the controller would drop out with Windows Event error 129, Reset to device, \Device\RaidPort1. The read portion of the software was fine, but it seems that as soon as it switched to Write tests, it would die, sometimes right away, at other times a few runs in. I started looking for a solution and updating everything, and one of the things that I wanted to update was the hard drive firmware. I looked up model number ST3450856SS + firmware on google and found that Dell also uses these drives for some of their servers, so I thought I will just flash the newest firmware from Dell into these and it will be happy...but this was not so easy...actually it was not easy at all. 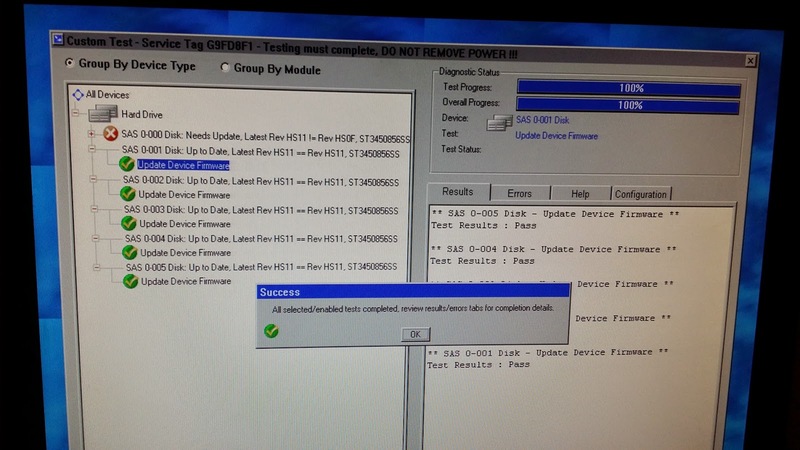 Now, on this Dell server I installed the Dell Openmanage Server Administrator and it showed that the disks were detected as ST3450856SS with firmware version 0007, and that the latest firmware available for these types of disks from Dell was HS11. Great, so I stared looking online to see what this is, and there isn't much information other then to ensure that you have the latest drivers and such from Dell, I do, and none of it worked. When I ran the above command, it finished running very quick, must faster then would be required to upgrade the firmware on 6 SAS disks, so I looked at the debug.log file it create for some clues. Upon running SASDUPIE.exe command again, it took considerably longer to complete, however, despite now matching the model number and firmware revision, it still failed. I was sensing that I was getting close, and thought that perhaps I need to flash the older version of the firmware first, but it was the end of the day for me so I left it for the next day. The following day I tracked down the HS0F firmware (F is higher than 6 in Hexadecimal, and HS06 is the minimum required, but I couldn't find that firmware easily) and opened it again in a Hex editor. This time, I made the same changes as before to HS0F firmware, replaced HS06 with 0007 and 15305 model number with 00000. At this point, I think it would work if you were to save the file into the payload directory and run SASDUPIE.exe command again, however, I didn't try this, as I already moved on to a different firmware upgrade process, but in hindsight I think it would have worked right from windows. Dell makes a downloadable utility called the "Dell SAS Hard Drive Firmware Utility" which can be installed in Windows, and then used to create a bootable USB drive to do firmware updates without windows. I ran the utility and it extracted the file contents to C:\Dell\Drivers\RG1GN\. If you navigate further to C:\Dell\Drivers\RG1GN\files\fw\sas\seagate\15K6 you will find all the firmware that is available for the particular Seagate drive. The files found here for HS0F and HS11 are the same files that you would have downloaded earlier, all in one place. I deleted all the other firmware versions and just left the HS0F.FWD file in there, the one I modified earlier to look for 0007 firmware. From this point, if you backtrack to C:\Dell\Drivers\RG1GN\ there is a utility called dddp.exe, run it and click on Install to a USB Flash drive, plug in a USB drive, and let it quickly build. Once I booted off the USB into the interactive mode, it found my drives and said the firmware update was available. I clicked on Update on each drive (it locks your mouse, so don't freak out, takes about 5 min to read S.M.A.R.T. information twice, you can see the countdown at the top) and to my surprise, it went! I did this to all 6 disks! After this was all done, I went back into Windows, and put the previously edited HS11.fwh file in and recompiled the boot USB, however, it failed, but I knew why! 0007 version no longer exists on these drives, they are all now HS0F! Going back into the HEX editor, I changed the HS11.fwh file again and adjusted the header to it's original state of DELL.HS11HS06. I rebuilt the USB boot file again, and this time, success! All drives were updated to the latest from Dell, HS11! Woo hoo! Unfortunately, it didn't solve my Perc 5 errors in Windows, but at least I knew the drives were not the contributing factor, at least not on the firmware level. I realize that this is very specific to one version of the drive, but I believe you can use this approach probably with most firmwares, and perhaps not only from Seagate, but I haven't tested that theory yet. As long as the firmware appears to have a Dell header, using Dell tools to update the firmware should be just a matter of making similar changes.